For more than 60 years now, Keukenhof has been the most beautiful place in the world, where spring bursts out in all of its colourful majesty. Here you can find inspiration and relaxation in a magnificent park environment. In addition to the millions of blooming flower bulbs and fantastic flower shows, Keukenhof has the largest sculpture garden in the Netherlands and is the most photographed spot in the world. The name says it all: these bulbs bloom in spring. 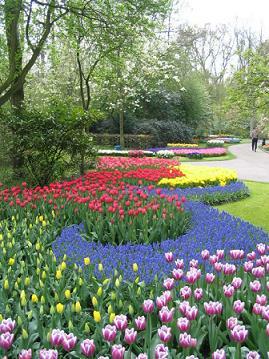 Keukenhof is therefore only open during this period. The other months are intended for maintenance activities at the park, and obviously for planting the bulbs, so that we can present colour and flowering splendour to you the following spring. On Saturday April 13,at 9.30 hours, the annual Flower Parade will leave Noordwijk to travel its 40-km route, along the main roads, to arrive in Haarlem at about 21:00 hours. The procession will comprise of 20 large floats and more than 30 decorated luxury cars, interspersed with marching bands. There will be plenty of space on the roadside for the hundreds of thousands of spectators who always congregate along the route. 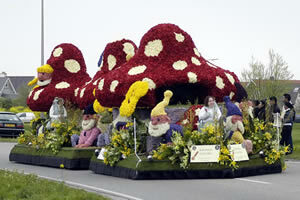 Also the Flower Parade will pass Keukenhof, alongside the 'Keukenhof Corso Boulevard' about 15:30 hours. Friday April 12 in the evening there will be an illuminated parade in Noordwijkerhout. The parade and floats will also be illuminated in Haarlem on the evening of Saturday April 21 and they will remain on view in Haarlem on Sunday April 14. The Flower Parade Rijnsburg travels every second saterday of August through Rijnsburg, Katwijk and Noordwijk. The procession wil comprise of 12 large floats and more than 50 decorated luxury cars, interspersed with marching bands. The parade leaves Rijnsburg in the afternoon and about one hour later it will be in Katwijk. Then it will go further to Noordwijk. At the boulevard you can see the diverent floats till sunday evening.